Youtube Test Drive Starring the all-new Jetta TSI is an interesting new Brand Channel from Volkswagen. The Auto brand has been very prolific with its use of new media and innovations all through last year and they continue that momentum well into this year too. The format of this brand channel is simple. It aims to answer questions around what makes the new Jetta TSI Special – and does it with the same cheeky humor that we see in the TV commercials. 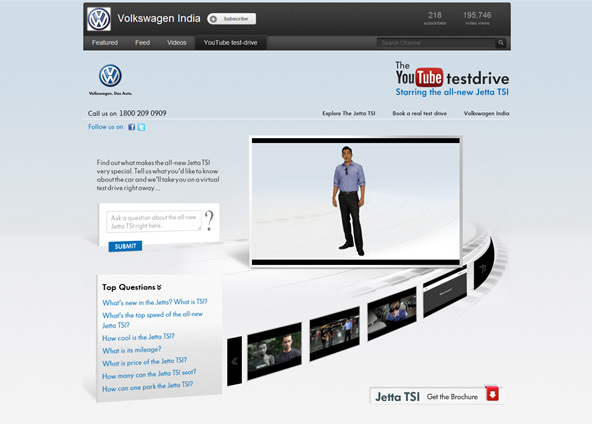 VW has brought together frequently asked customer queries on this zone, the answers to which are fun, engaging videos. Except for the odd accent in the intro video, I did find the videos rather amusing. The prompter on the query box is really efficient and you can choose to submit your questions as well (if they are not already covered on the zone) using Facebook or Twitter and download the PDF Jetta TSI brochure from the page. The creative is minimal, effective and there is attention to detail. There are link backs to the Volkswagen Jetta website, Facebook & Twitter pages. It’s refreshing to see brands in India rediscovering Youtube Brand Channels and using them in exciting formats to tell their stories. What do you think of the Volkswagen Channel? Does it work for you?